My friends Kellie and Aaron along with Kel’s husband Mike met for dinner at Tamarind to reminice about old times, catch up on new times, and eat some great Thai food. Every time I eat at a Thai restaurant I make a conscious effort to order something other than Pad Thai. Sadly though, my efforts are usually futile because I REALLY like Pad Thai. 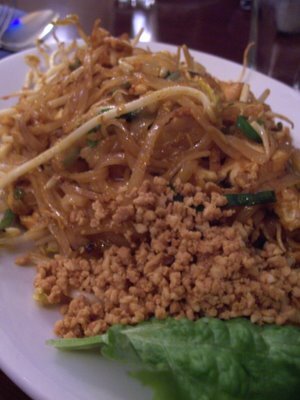 Although I tried hard to order something new, this visit was no different, I ordered Pad Thai. Tamarind makes a killer Pad Thai; I ordered mine with tofu. Other options include mock meat, vegetables, chicken, seafood, or beef. It must be noted that the noodles were superb due to their natural elasticity. I don’t think I have ever had such great noodles. Additionally, the sauce was appropriately sweet and sour. But since I like my Pad Thai on the sour side, I squeezed some fresh lime juice on top. Lastly, the tofu was fried to a nice crisp and the fresh bean sprouts brought a lovely crunch. Overall, a perfect rendition of my old standby. Kellie ordered a fantastic Green Curry. The taste of lemongrass permeated the entire dish.